I want to share details of two papers today which I have been quoting in my workshops and talks for a while now but which have just this month been published in the print version of the BJOG. Both concern fetal monitoring in labour, both are written by obstetricians at the same London Trust (St Georges) and both add further weight to the notion that we should be thinking very hard about what we are doing in this area. Are we (mis)guided by current guidelines on intrapartum fetal heart rate monitoring? Case for a more physiological approach to interpretation. This is one of a number of areas where our understanding of physiology has grown without widespread and concomitant consideration of how our changed knowledge might be applied to practice. While it only relates to part of the bigger question of what kinds of fetal monitoring we should be offering to women in labour, it is a welcome addition to the literature on a topic that affects so many women and babies. The second paper is equally clearly titled: Fetal scalp blood sampling during labour: is it a useful diagnostic test or a historical test that no longer has a place in modern clinical obstetrics? “Contrary to the popular belief in the UK, FSBS did not develop as an additional test of fetal wellbeing to reduce the false-positive rate of CTG. FSBS developed as a test of fetal wellbeing in its own right, used by Saling in Berlin, Germany in 1962, before commercial production of CTG machines in 1968. He took scalp blood samples from babies during labour to detect acidosis and published his series. This test, which was then developed as an alternative to CTG, was subsequently introduced in the UK, when CTG was found to have a high false-positive rate, to reduce unnecessary operative interventions.” (1056). This happens so often, and in so many areas, and it’s hard to spot where it is going on unless you have the time, skills and energy to take a deep look into the background of a subject. Which is why it’s so great when colleagues take the time to write articles like these ones. Chandraharan E (2014). Fetal scalp blood sampling during labour: is it a useful diagnostic test or a historical test that no longer has a place in modern clinical obstetrics? BJOG: An International Journal of Obstetrics & Gynaecology 121(9): 1056–62. Ugwumadu A (2014). 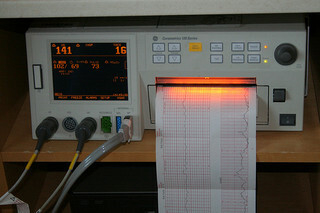 Are we (mis)guided by current guidelines on intrapartum fetal heart rate monitoring? Case for a more physiological approach to interpretation. BJOG: An International Journal of Obstetrics and Gynaecology, 121(9):1063-70. A midwife who has monitored a woman and the foetal heart during pregnancy through to & during labour “knows ” that heart beat, its volume and pattern. This comes with experience and cannot be taken as a rule. There is something in auscultation that you cannot get with foetal monitoring, it is something that develops between the midwife & foetus. She, the midwife will pick up subtle changes that start that cannot be seen or heard on a monitor. That does not mean that monitors are not valuable they are, especially where the women is being looked after by many changes of staff but on a 1/1 basis any variations will be picked up by an experienced midwife.